Online trivia is probably the biggest reason why I’ll go back to Buffalo Wild Wings, which appears to be available at the Chico location. Buffalo Wild Wings completed its expansion to Chico this week. Judging by photos of early lines and posts in my Facebook feed, it seems a lot of people are happy about the development. Although I love saying “The game is on!”, thanks to the eatery’s unceasingly repetitive TV commercials, I don’t know if I would go back after a visit to the Natomas location in May 2014. Why I may go back – While I was generally impressed by the huge bar area with a standing wall of giant TVs and the beer selection (although I think Sierra Nevada was largely missing), the food is pretty standard for this type of quick-service restaurant and the prices are higher than I think they should be (the Chico menu lists a wing combo at $16.79, otherwise fries and slaw cost extra). Ultimately, there was only one compelling reason why I could become a repeat customer and that’s online pub trivia. When I dropped by the first time, I was pleasantly surprised to see the old familiar blue consoles of Buzztime trivia. I first played Buzztime when I was living in the Midwest from 2001-05, but no Chico tavern has offered it for more than a decade … until now. With the blue console, a bar patron plays quick, 20-minute trivia matches with clues broadcast on one or two TVs scattered across the bar. The questions are nearly always multiple choice and the difficulty level is closer to the earlier rounds of “Who Wants to Be a Millionaire” than “Jeopardy!” After every question, you can see how you’re faring against other barflies. When the round ends, the scores are calculated across North America and you can see your nationwide rank. There are multiple types of games in the primary trivia channel, but there are other channels including virtual poker. During football season, many sites offer QB1, which allows contestants to win points if they correctly guess the offense’s play. During my visit, I was the only one really playing trivia (everyone else seemed to be focused on an MMA match featuring a fighter from Sacramento). Still, it was fun to play while I ate and had some soda. I can get my fix through a number of online and smartphone apps that are available, such as QuizUp, but Buzztime can be a little more sociable as the pacing of the games aren’t rigorous. While you want to ring in promptly when there are questions, there are frequent breaks to continue conversations with your friends (if you have any) and to order more food and drink (which is what I’m sure B-Dubs and other bars want you to do). Several of my friends and I have gone to live trivia at some Chico restaurants, which is generally fun, but can be quirky. 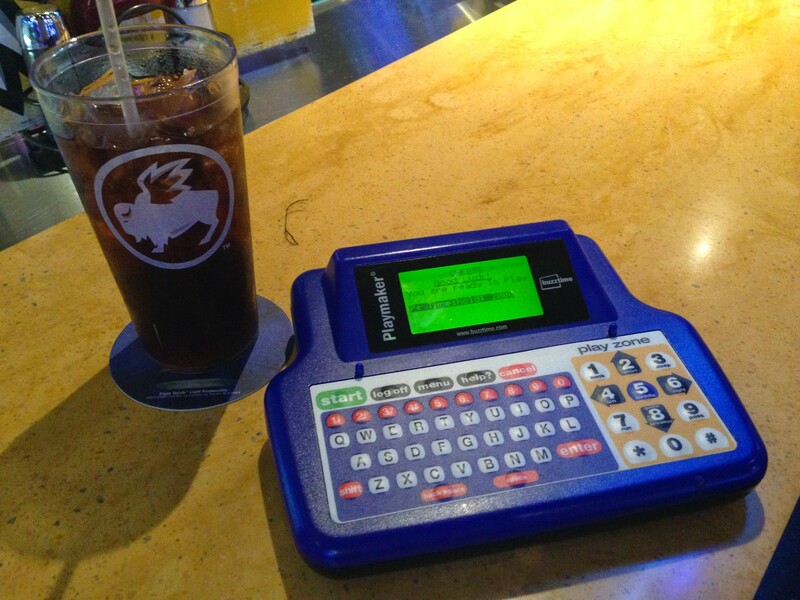 Online trivia like Buzztime is generally available anytime, so it may be easier to get a bunch of friends and just go. Here’s why I may never go back to Buffalo Wild Wings — the restaurant making Bud Light as its “Beer of the Month” in May 2014. Why I may never go back – While I was generally uncomfortable with the prices, there was one incredulous discovery that baffled me. 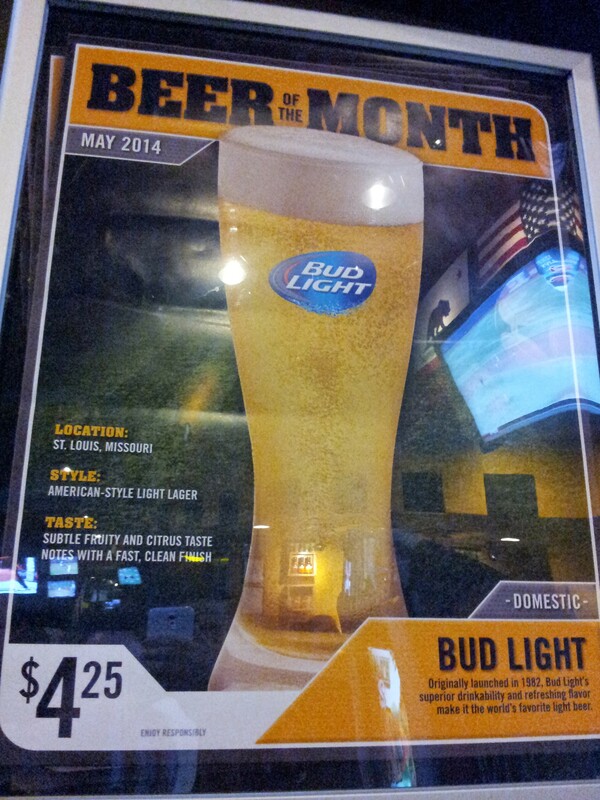 As I was leaving, I saw that the restaurant’s “Beer of the Month” for May 2014 was Bud Light. I’m not a fan of Bud Light (although it’s not unpalatable), but that’s not the primary reason why I was turned off to the point where I may never go back. Bud Light is _the_ most popular beer in America by far. Although sales have reportedly dipped recently, a Vox chart shows it outsold its nearest rival (Coors Light) nearly 3:1 in 2013. Given such market dominance, Bud Light doesn’t seem to really need to be highlighted as a “Beer of the Month.” It’s a default, go-to beer for a lot of people — you would expect nearly every bar in the country to offer this product. It’s like naming Christmas the Holiday of the Month for December, salt as the Seasoning of the Month or if Little Cesar’s named its ever-available pepperoni pizza as the Pizza of the Month. One possible factor is that Budweiser’s owner Anheuser–Busch InBev advertises the brand quite heavily. Maybe there was an advertising consideration when Buffalo Wild Wings made such a banal selection for its beer of the month? The price of this special brew was $4.25 in 2014, which wasn’t too bad, although one may find better deals on far more superior beers elsewhere in Chico. *sigh* Here are Buffalo Wild Wings’ beers of the month, as seen on Aug. 10, 2015. On a slightly positive note, Sam Adams remains its own independent company. At least there’s that, although Sam Adams seems to have similar issues to Bud Light. This entry was posted in Food & Drink, La vida Chico, Travels, World at large and tagged beer, Bud Light, Buffalo Wild Wings, Chico, featured, food, restaurants, trivia by RTOlson. Bookmark the permalink.